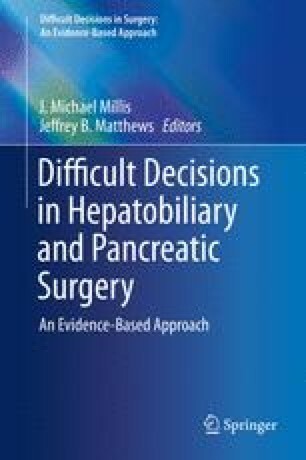 Surgery or Endoscopy for Bile Duct Strictures Secondary to Chronic Pancreatitis? A terminal benign biliary stricture (BBS) is a common complication of chronic pancreatitis (CP). Historically, BBS was a surgical disease, treated with operative biliary bypass. With the advent of endoscopic retrograde cholangiopancreatography and endoscopic stenting, therapeutic endoscopy has become the primary approach to BBS. Endoscopic management has limitations, however, including unsatisfactory long term durability. Improvements in stent technology and technique are promising. Surgery can often concomitantly best address other CP related complications including pain. Surgery has higher short term morbidity but may be more durable long-term. Minimally invasive techniques in biliary bypass are feasible.